According to one of our readers, today's shipment of Fable II Collector's Edition may wind up being less than it was cracked up to be, at least at some GameStop stores. After already being whittled down to near bare bones status, with special CE packaging and a limited Hobbe figurine having already been gutted, all that was left of the more limited SKU was the "Bonus DVD with a new 'Making-of' Feature" and exclusive in-game content. That content, which requires Xbox Live, featured the following. • "The Hall of the Dead" Dungeon • "The Wreckager" Legendary Cutlass Weapon • Spartan armor and energy sword If what we heard is true, some of you may not even get that.According to the report, GameStop corporate has already informed stores that "the majority of Fable II LEs have shipped without the DLC cards inside the case." Allegedly, that's due to two different manufacturing plants. "Gamestop has told stores that cases WITH an orange '48 hours of live' sticker includes the content, whereas the copies of the game without said sticker do not have the card," the reader wrote. "I can vouch for the missing DLC because I have my copy in hand and it does not include it." 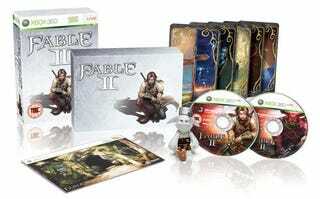 We've checked in with Microsoft PR to verify if this information is true or not, and, if so, how they plan on distributing the content to buyers of Fable II's Collector's Edition. Consider this rumor for now, but to be on the safe side, you might want to make sure your copy has one of those fancy orange stickers on it.